My birth story begins the day before my daughter was born, on June 6th, 2011. It was a Monday, and I was thirty-six weeks and 3 days pregnant. I had experienced a delightful and energetic pregnancy up until somewhere around thirty-three weeks, when the fact that I was housing a nearly full-term child in my ever-growing belly caught up to me. While I still remained somewhat active, I was constantly tired and consistently irritable. But this day was different. I woke up early, full of energy, determination, and excitement. I had been given a baby shower the weekend before, so I used my energy to shop for what was left that we needed for the baby and to completely organize her nursery. The next day, I had less energy than the day before, but still more so than in the last few weeks. I had a pre-natal appointment that morning, so I showered and arrived at the doctor’s office with my husband. We had known from a previous appointment that our daughter would be born before her due date of July 1st, but as the doctor checked my progress, he said he felt she would most likely wait another week or more. But, knowing my propensity for pushing myself further than perhaps I should at times, he told me to begin to take things easier. I went home and began to write when the Holy Spirit reminded me that I had one phone call I needed to make to prepare for my daughter’s arrival, and since I was ordered to rest, I may as well do it. I made the necessary call, but that led to another. After that was finished, I sat back down to work and chat with my husband on Facebook. I began to notice that the Braxton Hicks contractions seemed to be stronger and more patterned than usual. At 4pm, within a half hour of finishing the last before-baby call, my water broke. Facebook chat just wouldn’t do; I excitedly called my husband! My contractions were extremely intense and were coming 3 – 5 minutes apart within a half hour. We arrived at the hospital approximately forty-five minutes later, where we were informed that our daughter was in the breech position with the umbilical cord trapped beneath her foot, causing the danger of the cord being pushed out first, breaking the placenta away from the wall of the uterus. This could cause massive hemorrhage and possible death for one or both of us. 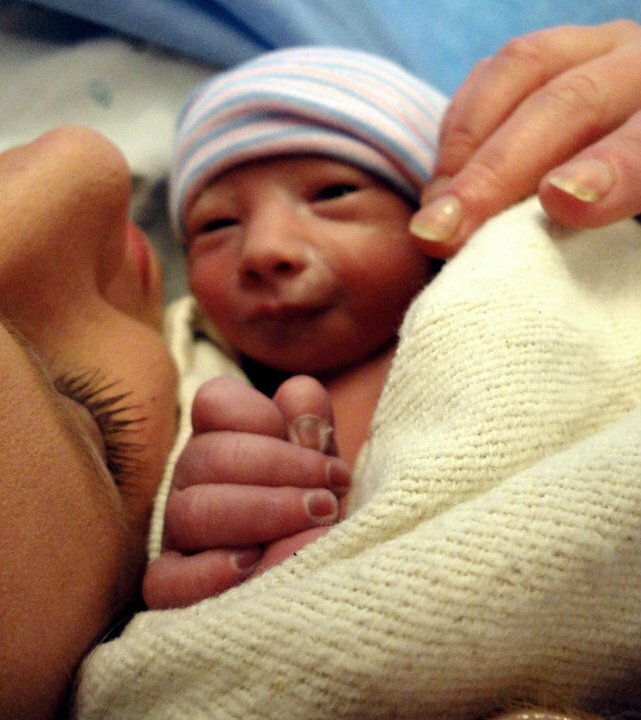 This meant I needed to deliver via Cesarean – something I was desperate to not have. When I heard the news, a black cloud of intense anger swept over me. My husband took a couple of steps backward, fearing my reaction. 🙂 But then the still, small voice spoke to me. Scenes from the past 2 days flashed through my mind’s eye in a matter of seconds, and I was shown how everything worked within a Divine plan. God showed me where He gave me energy to complete every physical task necessary before my daughter’s arrival, how He prompted me to complete last-minute details even when it wasn’t supposed to be “the last minute”, and that my husband was completely available and even talking to me at the time! My sweet Friend, Provider, and Protector had set every moment in motion, and gently reminded me that just because I was out of control did not mean that my circumstances were out of control, for HE was in control. He gently showed me that my daughter was not coming too early and she was not coming in the wrong way. This was His timing and I had nothing to fear. And so, on June 7th, 2011 at 6:03pm, Shelby Deanne, the light of our lives and joy of our hearts was born at thirty-six weeks and 4 days, weighing in at a strong and healthy 5lbs, 10oz, and measuring 18.5 inches long. “To everything there is a season, and a time to every purpose under heaven.” Ecclesiastes 3:1, KJV. This entry was posted in Family, God and tagged Birth Story, C Section, Ceserean Birth, June 2011, Shelby's Birth Day, Still Small Voice. beautiful! love hearing the story again! You are a very blessed woman!